Due to my lack of circus skills, I don't usually go to work on a unicycle – let alone an electric one with magic gyroscopes that, in theory, should keep me upright with my bones in one piece. But today is a bit different, as I've been tasked with demonstrating how it's possible to commute from London to a meeting in Bath without burning a) petrol or b) calories. To do this, I've been given an assortment of electric vehicles, among which is a self-balancing unicycle that might just compensate for my inability to ride anything with less than two wheels. Thankfully, I begin my journey in the familiar surroundings of a car, which will take care of the chunky motorway miles. The Tesla Model S is a luxury saloon that, almost overnight, has rewired the car industry. The first proper car from Silicon Valley, it has a theoretical range of 310 miles, meaning you could drive it from one side of the country to the other without topping up – a previously unheard of feat for a 100 per cent electric vehicle. as the car glides out of London and onto the M4. Progress is slick and swift, and any traffic-jam boredom is relieved by the 17-inch console-mounted tablet, which features a Web browser and a thousand other things to keep me entertained. Somewhere outside Bath, I park the car (which, incidentally, has easily enough charge remaining for the return journey) and consider my next weapon. I could take the unicycle, which is actually called the AirWheel Q3. As I turn it on, the gyros kick in, and it stands up all by itself like a little pet robot. Straddling it feels a bit like mounting R2-D2 (if he was being drunk and disorderly), and after several failed attempts I decide that, like any unicycle – gyros or not – it requires time and patience to master. I have neither. Then there's the AirBoard 1.0, which is like a Segway without handlebars. The idea is to step confidently onto the footplates and lean forward with your arms by your side, like a soaring ski jumper. Sadly, I look more like Eddie the Eagle, my arms flapping all over the place. The key, it turns out, is to make tiny movements and to steer with your eyes – just look where you want to go and it'll change course. Even the merest flex of your foot can get the gyros excited and, once you work it out, it's great fun. I'd take it into town and back if it weren't for the rather limiting nine-mile range. Thankfully, I have another toy for the job. It's called the GoCycle G2, it was invented by a former F1 designer and it folds up inside the Tesla's front bonnet. The frame is made from injection-moulded magnesium alloy, so it's light enough to pick up; there's a lithium-ion battery inside that powers an electric motor on the front hub; and it shifts gears automatically. And all this is wrapped in simple styling that would lead some people to think it's just a normal bicycle. Indeed, you can ride it like a traditional bike, with pedal power alone. Or, if you're feeling lazy, it'll whisk you along purely under its own steam. Today, I've tweaked the settings via a smartphone app, going for a mixture of manpower and electric for a boost up hills, of which there are many in Bath. With up to 40 miles of battery range depending on how hard you push it, plus infinitely more under pedal power, it'll take me into town and back to the car tonight.It's quite conceivable that you could use it for a substantial commute every single day, instead of taking the Tube or train or bus. The electric assistance is so generous that you'll arrive with dry armpits, having justified the purchase price by saving thousands of pounds on petrol or rail fares. Believe it or not, electric vehicles have been around in one form or another since the 1800s. 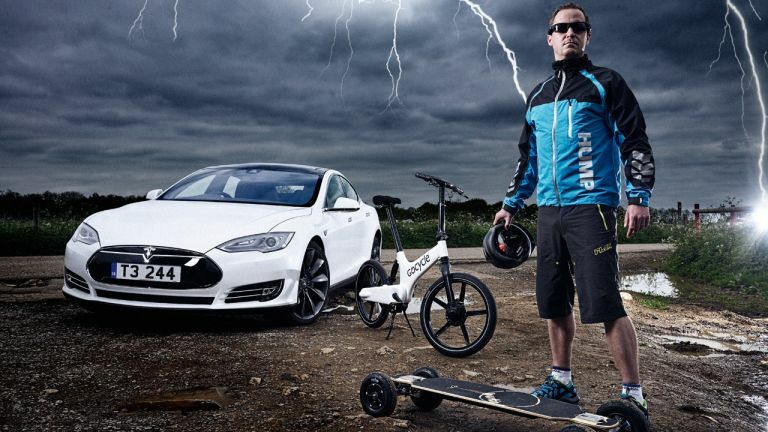 But even those early inventors may not have predicted that, in 2015, we'd be going to work on electric longboards with off-road tyres and a top speed of around 23mph. This one's called the Bustin, and I've been carrying it in a special backpack while riding the bike. After the robotic AirBoard, the Bustin feels springy and organic. You just bend your knees like a surfer, pull the trigger on the handheld remote and you're soon carving through pedestrian traffic like a gnarly pro. Or maybe you'll grab the brakes too hard and dive off the front into a surprised pensioner. Apologies to that gentleman. It'll tackle muddy tracks and grassy parks, though hard use will burn through the battery life. Still, it's good for nine-ish miles of regular use, which is enough for the last leg of my journey. Well, almost the last leg. As I arrive at the office, T3 magazine editor Rob appears with a gift: a pair of electric 'Rocket Skates' that have just arrived from America. They'll take me through the office and into the meeting room, completing my 108-mile journey of electric propulsion in a smooth and stylish fashion. Unfortunately, when strapped to my shoes, they look like weird foot chariots and I feel ridiculous. The idea is to push off with your back foot to activate the motors, then glide along with one foot slightly ahead of the other. What actually happens is that I stumble along the corridor, fumbling at the walls like I've had nine pints of cider. And after five minutes on the skates, I'd like to go to the pub and do exactly that.